The storm is moving steadily toward the Carolinas’ coastal areas. Most of the North and South Carolina coastlines are under storm surge and hurricane warnings or watches. According to the NHC forecast at 5 p.m. on Sept. 12, the storm is forecast to slow down near the coast of North and South Carolina before it passes over the states and into Georgia. 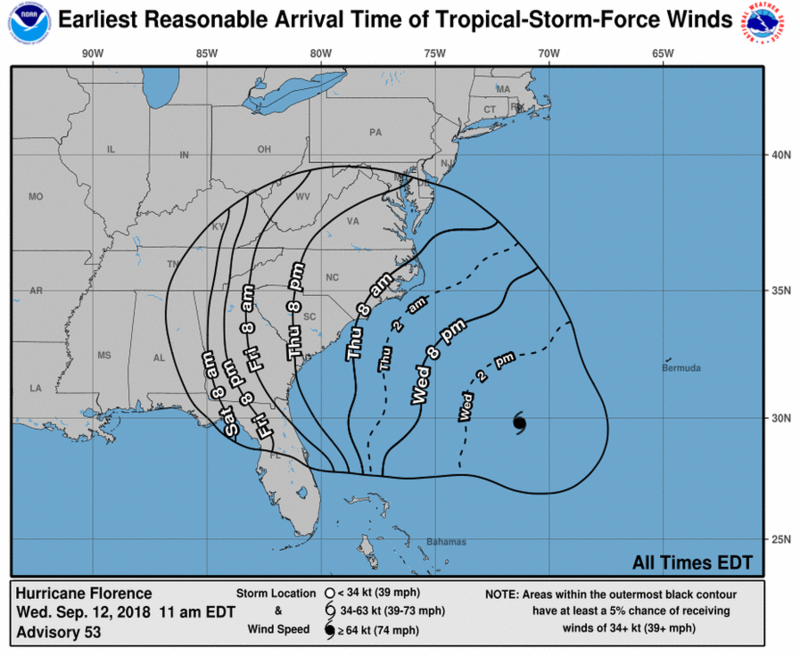 The forecast “cone of uncertainty” shows that Florence might severely affect the Carolinas, Virginia, Georgia, Alabama, Kentucky, and Tennessee by Monday. “Data from an Air Force Reserve hurricane hunter aircraft along with satellite imagery and various intensity estimates indicate that Florence has weakened instead of strengthening. However, while the hurricane hasn’t strengthened in terms of peak winds, the inner-core and outer wind fields have continued to expand, resulting in an increase the cyclone’s total energy, which will create a significant storm surge event. The upper-level outflow remains impressive and is still expanding except toward the south,” according to the NHC’s forecast discussion. Jeff Byard, who is the FEMA associate administrator for the Office of Response and Recovery, said that Florence is “a very dangerous storm,” Fox News reported. “This is going to be a Mike Tyson punch to the Carolina coast,” he warned. President Donald Trump has states of emergency for North and South Carolina along with Virginia. Duke Energy told The Associated Press that damage from Hurricane Florence could cut off electricity to three-quarters of some 4 million customers in the Carolinas. The outages could last for weeks. “This will likely be the storm of a lifetime for portions of the Carolina coast,” the National Weather Service in Wilmington, North Carolina, wrote on Sept. 11. The flooding in southeast North Carolina and northeast South Carolina might be “unprecedented,” according to the agency. “Strength, track, and forward speed of Florence will be the major players in determining the scope and amount of rainfall and correspondingly the severity of inland flooding,” according to AccuWeather forecaster Dan Kottlowski on Sept. 12.